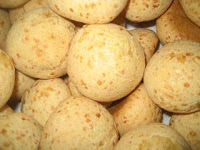 Ms. Celiac Says...: The Best Brazilian Cheese Bread! If you are tired of going to restaurants and watching everyone else savor the delicious bread while you patiently starve as you await your entree, then why not go to Coffee Shop?! At Coffee Shop, located in NYC's Union Square, you can order Pao de Quejo or Brazilian Cheese Bread. Pao de Quejo is naturally gluten free! It is made out of cassava flour or tapioca starch! There are an assortment of other dishes that can be prepared gluten free at Coffee Shop too, such as egg dishes and fruit platters, but the Pao de Quejo is the best! Coffee Shop is open 7 days a week for breakfast, lunch, and dinner! So, why not check out Coffee Shop this weekend?